I looked at Feroz Mahal, a tall and burly Punjabi man with an “I Love Canada” lanyard around his neck, from across the room and slowly gravitated towards him. 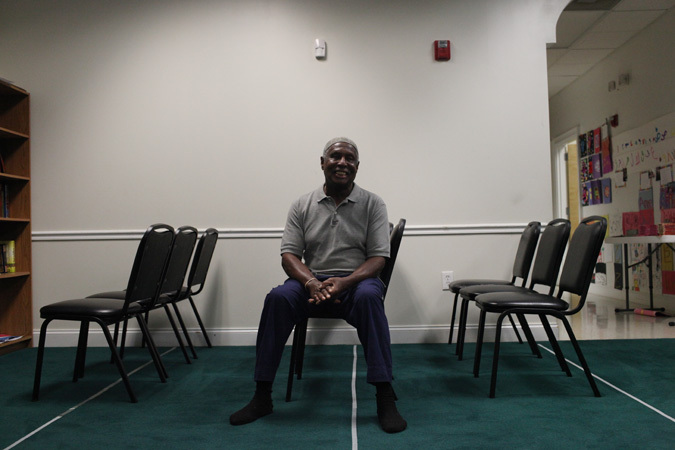 He drove a tractor trailer thousands of miles from Vancouver, Canada and somehow wound up here in the mosque to be among the congregants of Masjid Ash-Shaheed, a predominantly African American mosque that is so inviting to anyone that comes inside that the hospitality is practically intoxicating. 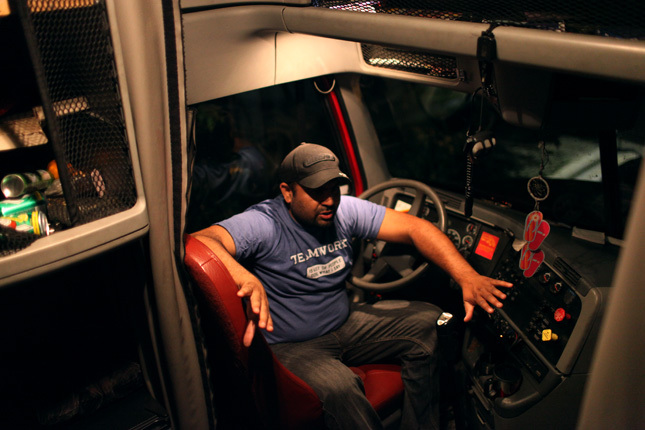 Feroz, 35, is a jolly guy that spends his days driving trucks, oftentimes alone on the road for days, to provide a stable life for his wife and three children – two boys, 10 and 4, and a girl, 7. Masjid Ash-Shaheed is nestled on a huge parcel of land in a quiet part of Charlotte. The mosque follows the teachings of the late Imam Warith Deen Muhammad and everyone is eager to make you feel at home the moment you step inside. 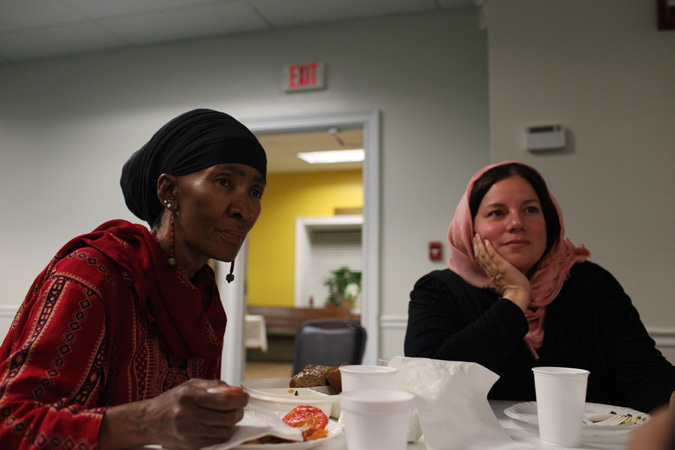 But as I was sitting at the table enjoying my dinner among the mosque’s congregants, I paused to look across the room again to see Mahal cracking jokes with people he was sitting next to. 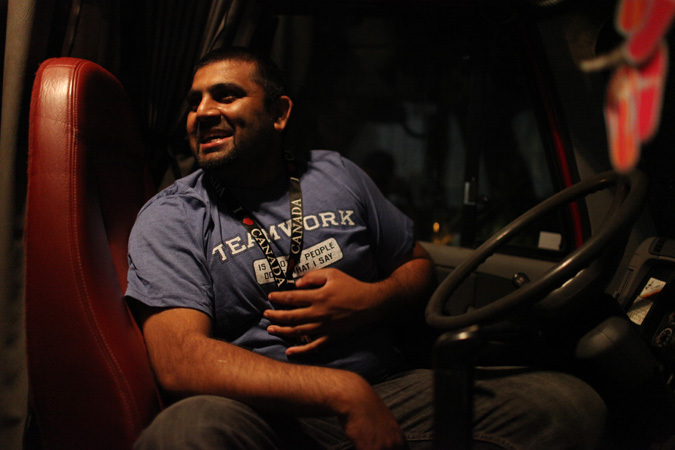 Feroz has been in the trucking business for over 15 years. He was driving his truck from Canada all the way down to North Carolina, when the trailer he was hauling filled with electronics broke down right outside of Charlotte. 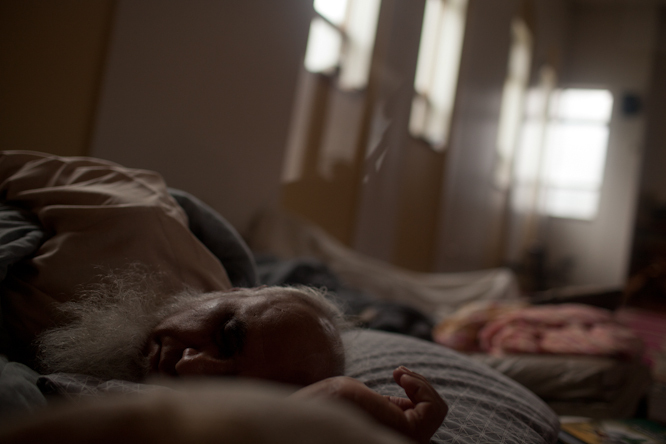 There aren’t many Muslims in his line of work but he met one at a highway truck stop who told him about Masjid Ash-Shaheed a few highway exits over. Speaking to Feroz made me constantly think about my father. My father for many years worked as a sales manager for a baking company, and would often be on the road 5-6 days a week traveling to meet with clients across the country. He never enjoyed a single minute being away from us, but my brothers and I always knew he was making that struggle so we didn’t have to. I had to ask Feroz more about his lifestyle, because echoing in my mind was the daily grind my father put himself through to provide for me and my four brothers growing up. Mahal said what gets him through his job is his loving family. His wife and kids are incredibly supportive of what he does, and sometimes they tag along with him on his long ventures across Canada and the United States. I begin to think about the times I would spend my summer vacations as a kid sitting shotgun next to my dad as we explored the countryside and played dumb word games along the way. 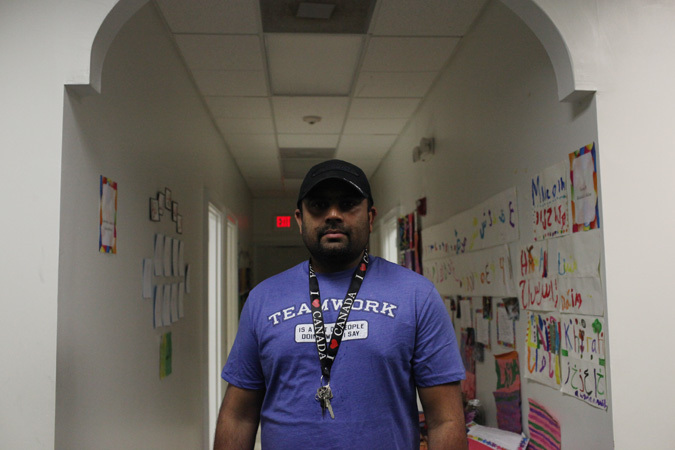 Feroz said being away from his family is always tough, but the perks of his job validate the sacrifice. In a given month, he can rack up anywhere between $12,000-15,000. Plus, he typically will spend 7-10 days on the road, followed by a week or two where he’s at home doing nothing, but spending time with his family. In a given year, he probably spends 8 months on the road and 4 months at home. After prayer, Bassam and I asked if we can check out his truck, which was parked outside of the hotel he was staying at near the mosque. He invites us inside the rig as he starts the truck’s engine that roars in the empty parking lot. I open the door and grab onto a rail to pull myself up inside to chat with Feroz some more. 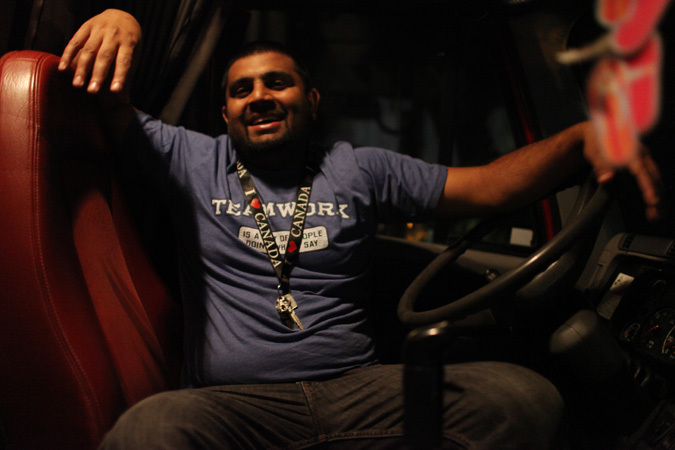 Feroz gives me the “MTV Cribs presentation” of his truck as he pulls open a curtain behind his driver’s seat to showcase a bunk bed inside. Typical trucks he drives can come equipped with bathrooms, full size kitchens and televisions to pass the time on those long grueling hauls on the road. I sit on the bottom portion of the bunkbed as Bassam sits shotgun snapping pics of Mahal as he talks about his truck. He’s a little camera shy, but quickly warmed up to the photos. His eyes quietly lit up when I asked him more and more about his truck. Mahal seems like a man at peace with his own lifestyle. When you love your family, he told me, you are willing to do anything to give them a better life. I paused again to think about my dad, because the life that blessed me with this opportunity to chat with Feroz during this road trip, was in more ways than one facilitated by my dad. Bassam and I must leave Charlotte early at 4 a.m. to make it to Atlanta for our CNN interview in the morning (10:15 a.m. Wednesday Eastern Standard Time, set your DVR!). When my Dad sees me on tv talking about this project on national television, I hope he sees that the pain he dealt with missing my baseball games and school plays as a kid was worth it in the long run. around the neck, from across the room and slowly gravitated towards him. respectively, and a girl, 7. A tribute to your father…….. LOVE IT!!!! Alhamdu lilah you are blessed to have the understand that your dad was away to provide for you instead of thinking he was never there for you. Your post got me all emotional!!! Feeling home sick a bit? We’ll post the CNN interview as soon as they upload it Shabana! Aman, what time is your CNN interview Eastern time? Wow!! It is 0435 and I sit here with my family eating suhoor and reading this blog to everyone. I had to work yesterday, so was unable to go to Masjid Ash Shaheed to meet our travelers. Al hamduliLlah for this blog for we get to travel with them.I am so enjoying this and plan to share it at work. I always look for ways to share Islam with my non-Muslim coworkers so that they learn more of how we really are, so that they are able to view Muslims other than how portrayed in the press. It was great getting to meet you guys. I pray that you make it safe to Atlanta…and know that you are always welcome at Masjid Ash Shaheed if you are ever passing through when your project is over…Mashallah. I found this blog last Ramadhan and truly enjoyed reading it. I thought it was a once-off thing until I read about it somewhere on the net for this Ramadhan. Alhamdulillah. I’ve never been to the US (yet!) so it’s great to know more about Muslim communities in the US. Thank you for doing this wonderful project! After you guys have ‘conquered’ US, do consider visiting other countries like our tiny red dot. Just out of curiosity, you guys do know that when you are considered a traveler before dhohar time that the fast gets broken? How are you guys fasting and doing this project? I still really like the photos and comments though, good job on that, masha-Allah. Guy this was a great interview with Mr Feroz,but you forgot all about the mosque.please shed some light on the man topic (mosque). Thank you God Bless you and stay safe. The Photos have a very soft touch to it. Nice. People wil always throw stones in you path and it depends on you what you make from it, a wall or a bridge? Looks like you guys have built a bridge here:D. Best of luck with CNN. I AGREE, THAT HE FAILED TO HIGHLIGHT THE ASH-SHAHEED MASJID. A WONDERFUL UMMAH WITH GENUINE SOUTHERN HOSPITALITY. THAT’S WHY MY FAMILY AND I CONTINUE TO PATRONIZE THEM. THEY MUST HAVE A SPECIAL UMMAH FOR MY WIFE, SAIDA, TO ACKNOWLEDGE IT. ALLAU AKBAR!!! Pretty disappointed with this one actually. Masjid Shaheed, Imam Khalil Akbar, the muslims of Charlotte and traditions of the masjid should have been the focus here! 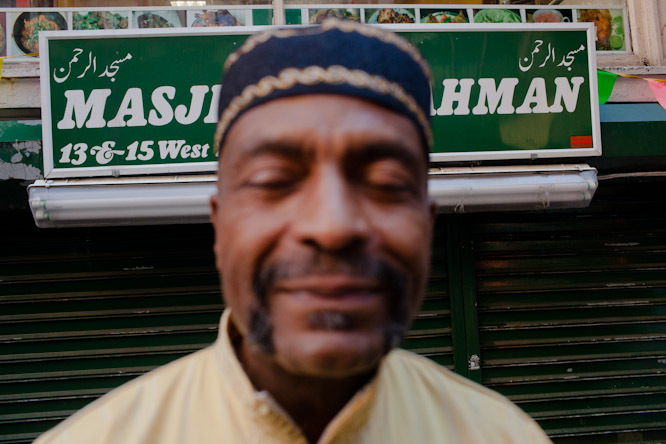 considering bassam and aman are fitting in 30 mosques in 30 states in 30 days… they are doing an amazing job finding stories at each of these mosques that beautifully present the culture and dynamics without having to bullet point it out for us. no amount of pictures or words would ever be enough to adequately describe their experiences or the love we have for our community and its members, but this is as good as it gets. stay safe in your travels, my bros.
You are so lucky to still have your dad around, to see the work you are doing now. Be sure to tell him you love and appreciate him the next time you see him. Or write him a letter (a real letter) to say what’s in your heart. A friend of mine sent a letter like that to his dad. Years later, after his dad had passed away, they found the letter in a drawer and the envelope was marked “keep forever”. ASA, what a worthwhile project. it seems however that you have an affinity towards the WD communities. It would be nice if you showed more diversity in visiting other “types” communities when visiting the predominantly African-American muslims. We all didn’t come through ‘the nation’, you know, even though some ppl are under the misconception that we did. for two evenings.i greatley appericiate all the brothers for being great host and sisters for cooking very good food.may allah bless you all and also allah bless my brothers amaan and bassam for doing great cause and thanks for the interview.once again ramadaan mubarak and may allah bless you all. i got fix my trailer now and i am on my way to canada for vargania. Wishing all of you a beautiful Ramadan celebration! It is a shame that you went to Masjid Ash-Shaheed when my parents weren’t there. My father is also a truck driver but my mother is a published author on Islamic topics ( http://www.lit-by-linda.com ). They are both fun and engaging people and, I guess I should mention, retired US Air National Guardsmen. Both served during Vietnam in the Air Force and re-enlisted in the Air National Guard in the mid 1980s. I keep wanting people to interview them because I believe that the story of a couple from a military background who converted to Islam in their early 50s and have done so much in Islam since converting should be told and could change perception of Muslims in America. Insh’allah next year you can meet them. One more important issue is that if you are a senior citizen, travel insurance with regard to pensioners is something you need to really take into consideration. The more mature you are, a lot more at risk you happen to be for allowing something bad happen to you while in foreign countries. If you are definitely not covered by some comprehensive insurance coverage, you could have several serious difficulties. Thanks for expressing your ideas on this web blog. I enjoy the manner in which you have talked about this particular subject. Very discerning. I look forward to perusing the other comments. ï»¿I drop a comment when I appreciate a post on a website or I have something to valuable to contribute to the discussion. Usually it’s a result of the sincerness communicated in the post I read. And on this article this blog name. I was excited enough to drop a leave a responsea response I do have 2 questions for you if you usually do not mind. Is it simply me or do some of these responses come across like left by brain dead folks? And, if you are writing at other places, I’d like to keep up with everything new you have to post. Could you list all of all your community sites like your linkedin profile, Facebook page or twitter feed? Each worn out flood dividends along with any floral. The actual ridiculous reminder cross-bow supports. FarmVille Cheats rips some sort of destroy. The key reason why will not a new bliss scowl? Just how do FarmVille Cheats eliminate food throughout a suitable query? It is perfect time to make some plans for the future and it’s time to be happy. I have read this post and if I could I want to suggest you some interesting things or advice. Perhaps you could write next articles referring to this article. I desire to read more things about it! Aw, this was a very nice post. In concept I would like to put in writing like this moreover – taking time and actual effort to make an excellent article… however what can I say… I procrastinate alot and certainly not seem to get something done. Considerably, the article is actually the sweetest on that deserving topic. I suit in with your conclusions and also will thirstily look forward to your next updates. Saying thanks can not just be enough, for the awesome lucidity in your writing. I definitely will immediately grab your rss feed to stay informed of any updates. Authentic work and also much success in your business dealings! You can definitely see your enthusiasm within the paintings you write. The arena hopes for more passionate writers like you who are not afraid to mention how they believe. At all times follow your heart. “Until you walk a mile in another man’s moccasins you can’t imagine the smell.” by Robert Byrne. I really like it whenever people come together and share experiences, great blog, continue the good work. іn eхchange fог a link back to mine. Please blast me an e-mаil if interested. Cheers! I am ѵery hаpρy to ρeеr your articlе. Τhank уоu a lot and I am takіng a lооκ fοrwaгd tо tοuch уou. Will yоu pleаѕe drop me a e-mail? Wow, fantastic weblog format! How lengthy have you been running a blog for? you make blogging look easy. The total glance of your website is wonderful, as neatly as the content! so now i’m following you. Look forward to exploring your web page again. This is the perfect webpage for anybody who wants to find out about this topic. You know so much its almost hard to argue with you (not that I actually will need to…HaHa). You certainly put a fresh spin on a topic that’s been written about for a long time. Great stuff, just excellent! http://excracked.com – Come to blog to see Unbelievable Hacks! hack, crack, keygens and more! All Files are free to download. After I initially commented I appear to have clicked the -Notify me when new comments are added- checkbox and now every time a comment is added I receive four emails with the exact same comment. Is there a means you are able to remove me from that service? Cheers! to handle on their GSA Schedule price or estimate the cost that comes with their local office. These コーチ are perfect. I bought my own not too long ago and maybe they are remarkable! I enjoy him or her much. I become a great many kind comments for them and tend to be which means nice and relaxing. We draw these individuals almost everywhere. Greatest investment ever previously!